parentwin: When Is Violence Okay? I saw it on my Facebook feed and it got me thinking. Now, I'm going to skip past all the normal stuff, like, how would the originator of this image know that my childhood was awesome just because I remember this episode of Tom and Jerry? 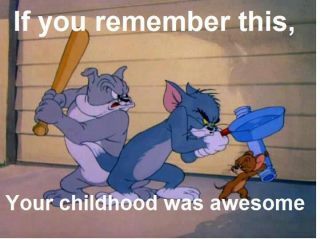 Perhaps every child born from 1975-1987 did not have an awesome childhood just because Looney Toons were on TV, right? I'm going to get right to the point. Is the violence acceptable or not and have we wussed out as parents or not? And is it adversely affecting our kids? "Well, I grew up with it and I'm fine." "It teaches kids to stand up to bullies and outsmart them." "Kids are smart enough to know it's just television." "It teaches children to be violent and that hitting people is okay and hilarious." Both of these sides have been done to death and I'm not going to flesh out either one of them. That's why we all went to 6th grade debate class, right? I think the real issue is that we try to fit all families, all kids and all parents into one generic mold. You know what your kid can handle. You know what you want to explain. You know the maturity level of your child and his ability to tell reality from make-believe. You know your situation in life and how the cartoons would affect your particular children. So, go for it. Or don't. But, really, stop crying about it. You don't like Sid the Science Kid? Go out and buy some old-school DVDs. They're funny and awesome. I remember them. We'll chill with PBS for now because I have a hard enough time answering my kids when they ask me why Rapunzel's mother died when she fell out of the tower, why Ursula gets so big when she takes over the ocean, and what the heck that green stuff is leaking out of Maleficent. Also, why do the trees grab Snow White, and do they have to be afraid of trees, too? They're old enough now where they're simply curious. They're not actually confusing the videos with reality...meaning they don't really think the trees are out to get them. But they do love their questions, and I just don't have the energy. In my opinion, it doesn't matter if you show the violent cartoons or not. It's not going to make your kid into a wimp or a serial killer. What's important is how the real people in that child's life act. The real-life fighting, how does it go down? The real-life discipline. Because you're already working (supposedly) on teaching your kids that what goes on in the TV isn't real, I would think that lesson would sink in. What will also sink in is how you, personally, treat your kids and your partner in front of them. The danger isn't in the television. It just isn't.